Wow, amazing skin man (I noticed it is from WMP11). I love it, thanks a lot. 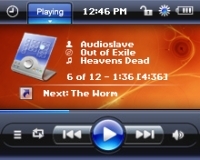 I have to say that your " Green5g Rockbox theme" is even cooler, if you could port it for the iPod Color/Photo, that would be amazing. Please try Senab's builds for your pleasure and ask him to include the unicode support patch because the problem is that I try to write new patches and it's pretty hard to do them with all other patches already applied to the source that's why in my latest builds I didn't use almost any other patch besides my owns. any idea why your theme allows the menu on my iPod color (4G) to start 1 pixel under the battery indicator instead of nicely under your blue 'MENU' bar? This should fix your problem, but please note ther is no album art support in my builds (yet) but I plan to add it in the next release. Humanity has hope in Julius; it's corrected. What was the 'jbuild' version as compared with the 'latest daily' which I had previously installed from the main site? I'm not sure I understood your question as I should but I mark my builds with the same date as I use for the source, so for e.g. if I downloaded the source on 2006-08-20 I will mark my build with the same date. But I can't see the track-id's. How do I fix this, so I can see witch song I'm playing. is this still alive? im just wondering where do i extract the build to on my ipod, and where to extract the theme? i cant seem to find this info anywhere, i will continue my search though..
Yeah, it is alive, the builds work and the themes too with them, I'm still using the latest build and I never had any problems with it on my iPod 5g so you shouldn't have too, the only problem is that it's a bit outdated so new features aren't included in these builds, but I hope sooner or later I will update them. Regarding the paths to install, just unzip the build to your "/" (root) directory and the themes should be unzipped into the "/.rockbox/" directory and that should work. Hi again just to ask for your permission to have a go at trying to port your green theme to the nano ?? Sure, you have my full permission and I would like to thank you for considering this and for taking the tome to port it ower. If there is anything just let me know. 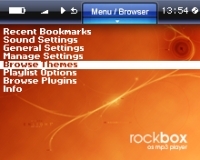 This is by far the best rockbox theme i've ever seen, all thumbs up for you Julius. I have an iPod Photo (iPod 4G Color in rockbox terms) and want to build the latest SVN with the necessary patches to use this theme, but I can't make it build. Could anyone tell me which patches and in which order do I have to apply them for this to work? I really want this theme on my iPod. and the order of applying them is numbered so just apply them from 01 to 10 and that should work. Thank you very much Julius for your dedicated time to this beautiful l work of art, Its very cool, and not boooooring like apple firmware. Im going to install it to my ipod video. and all my friends want this on their ipod videos too. Hey man where do i put these patches and what font do i use for the best effect, i also have a problem with the theme there always seems to be words in the titlebar at the top unlike your pics, is there anything that can be done. thanks! The patches have to be applied to the source code, please google around or better see rockbox's page about howto apply patches and howto create your own build, but the more easier way would be to use the Evil-G Fusion build, you can find it on forums.rockbox.org just look around in the Custom builds threads. The themes have to be updated cos there are new tags and the new patches have been rewritten a lot, so if anyone of you guys can send me the links to the new wps codes I would be grateful and I would overwrite the current ones so in the future you won't have to dig around for them. Hey, is this project still supported? I added you on yahoo and msn to talk about it if you have the time. Thanks for your work. Not really, but the good news is that even if I haven't been able to keep the updates comming other developers have picked up my patches and they do good work to keep them synchronized so with those new patches you should be able to get it to work again, just go to the http://forums.rockbox.org and have a look within the "Custom builds" thread on the "EvilG Fusion build", that should have already all the new patches included but because these were changed you may need to use a new theme package too, but searching on the forums you should find them cos as I saw people ported the themes to the new patches too so from there you should be able to get everything you need to get them running. I hope to be able to come back sometimes and make my own build again, but till then the above way is the best way to get everything running. Hey thanks for responding. I went into the unsupported builds thread and I saw several EvilG builds but they were only for 5g+. The only build that is there that works with my iPod is yours and it doesn't appear that they have updated it because it links back to this site and shows the patches and things that I have already downloaded. Can you add me on msn or something so maybe we can talk easier? I have a couple questions I would like to ask you. i've spent the last 3 hours searching google with little to no luck. if someone would be nice enough to build with the current patches and send me a link to the patched file(s) i would greatly appreciate it. anythingbutipod forums are more current/updated. free to register.